The threedecker ROYAL LOUIS of 1780 with her 122 cannons was one of the prominent first rate ships of the line in the French royal navy. The ship represented a high point of technology development in ship building. The model was made according to the plans of 1779. That excellent model of the ROYAL LOUIS is a very beautiful piece of art. 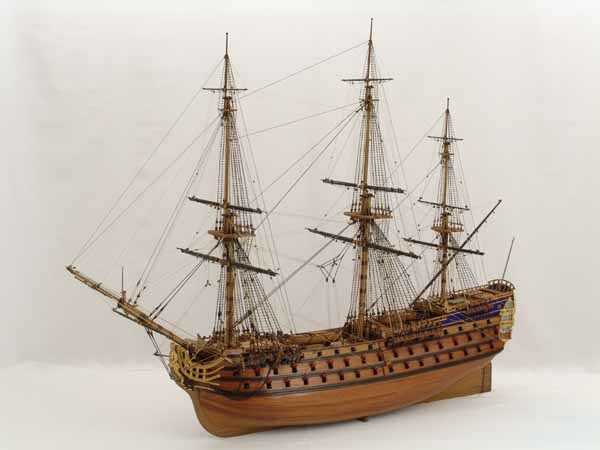 The ship's power, the elegant lines of the hull and the impressive rigging are exquisitely shown in the model. The model of the ROYAL LOUIS is 1 : 90 scale. Length is 108 cm, width 44 cm, height 94 cm. Without stand, placed directly on a flat surface, the height would be only 85 cm. The ship model is not fixed to the stand. Alternatively, it could be set directly on a flat surface, as shown in the photo on this page. Have a look at the set of photos. There are several views of the entire ship model and closer views of hull, deck and rigging. Click images to enlarge!